Helps control hunger. Milk chocolate flavored coating. Meal-on-the-Go: 220 Calories. Good source of protein; 30% of Daily calcium; 22 Vitamins & minerals. Research has shown that diets high in protein and dietary are satiating. Slim-Fast Optima meal bars provide a good source of protein (8g). When consumed as part of a diet rich in protein and fiber like the Optima Diet, Optima meal bars contribute to hunger control. 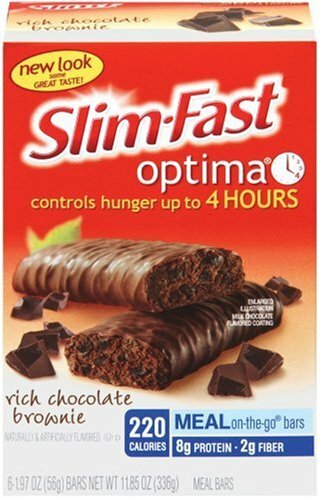 Achieve your weight-loss goals on the Slim-Fast Plan with Slim-Fast Optima Meal Bars! Helps control hunger. Great Balanced Nutrition (per serving): Protein: 8g; Less Sugar (35% less sugar than our original milk chocolate peanut meal bar); Antioxidants: 35% of the Daily Value for Vitamins C & E; Calcium: 30% of Daily value; 22 vitamins & minerals. A convenient meal with great taste to help nourish your body and cut your calories to help you lose weight successfully! My favorite Slim-Fast bar, but certainly not the healthiest. I eat one of these for lunch 3-4 times a week. They're pretty good for being what they are. They are 4 Weight Watchers points, FYI.